• PREMIUM VG10 DAMASCUS STEEL--- Imported Japanese VG10 Super Steel with 67-layer High Carbon Stainless Steel - with an exclusive Damascus Pattern using Liquid Nitrogen treatment under -270 degree below zero to ensure Long Lasting Performance! • All In One Knife---If you want a perfect knife for your kitchen,this GYUTO Chef's Knife would be it.With Multi Function for Chopping,Mincing,Slicing and Dicing. 12-15 Degrees Razor Sharp Edge for Maximum Sharpness & Safety. Meat, Fish, Vegetables, Fruit and more are Precision Sliced. No tearing or squishing, only Ruthless Efficiency. • ERGONOMIC DESIGN HANDLE----With G10 Fiber Mitaka Handle,to ensure a Secure and Comfortable Grip. 12-15 Degrees Razor Sharp Edge for Maximum Sharpness & Safety. Meat, Fish, Vegetables, Fruit and more are Precision Sliced. No tearing or squishing, only Ruthless Efficiency. 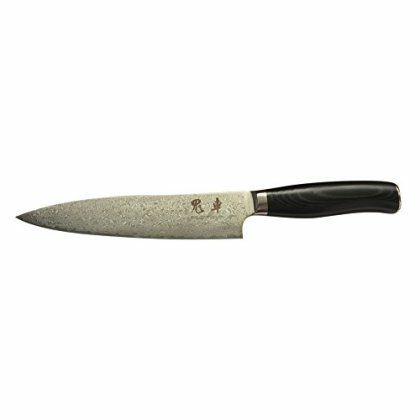 • 100% SATISFACTION or MONEY BACK GUARANTEE - Our Chef Knifes have been built with Perfection in Mind. Ideal Gift (Christmas, Weddings, Birthdays, Fathers Day, Mothers Day), for Home Cooks, Professional Chefs, Culinary Students and more. We put the CUSTOMER FIRST and we stand behind our products. We offer a limited LIFETIME WARRANTY backed with a 60-Day, No-Hassle, MONEY BACK GUARANTEE. Click the ADD TO CART button now and enjoy with NO RISK !